With journalism currently battling social media, there has been the question and research into how journalists and newsrooms have been engaging with their audience. The panel “Research breakfast: Trends in Online Journalism Research” was held on the second day of the 19th International Symposium on Online Journalism (ISOJ). This panel included five professors talking about their research. The panel was led by Seth Lewis, Shirley Papé Chair in Emerging Media at the University of Oregon, who has also worked with Mark Coddington, assistant professor at Washington and Lee University. Coddington is collaborating with a group of scholars in a survey project about journalists and audiences. The survey was sent to American journalists about audiences and has been made into three surveys that are in different stages of being completed. Among the surveys, Coddington is specifically focused on one that tests the classic sociological ideas related to how journalists view their audiences. “Herbert Gans and Phillip Slazenger [talked about a] kind of idea that journalists view audiences as extensions of themselves and their own social worlds where they essentially are thinking about their audiences when they’re really thinking about themselves, their friends, and their families,” Coddington said. With the view of audiences for journalists, there is also the aspect of digital news’ use of transnationalism. Lea Hellmueller, assistant professor from the University of Houston, discussed her research into the ways journalists can promote a global perspective in their reporting, especially regarding issues such as terrorism and global warming. “I’m working on looking at global news startups, how journalists embrace more and more global media ethics and trying to understand what is actually global media ethics and is there even such a thing,” Hellmueller said. A finding of Hellmueller’s is that global media reflects how journalists think of their roles which is dependent of their socialization in media organizations and how that mentally impacts content. Another finding is how in some countries there is dependence on right-wing media that includes transnational news. “It’s also an opportunity for citizens to know that free, objective media is not just something we can take for granted but something we also have to actively work on,” Hellmueller said. Magdalena Saldaña is an assistant professor from the Pontificia Universidad Católica de Chile whose research deals with the trends of comments left on online news, particularly surrounding coverage of the 2015 earthquake in Chile. While there is a massive consumption of news on social media, there is a lack of engagement on online news. This is due to some people being scared of the trolling that can come after leaving a comment online. According to Saldaña, one way to reduce instability is to have reporters responding to comments and liking comments. In studying 4,000 comments, Saldaña found some key findings. “The narratives from the media and readers kind of overlapped where they were also repeating the media but they were also stating their own narratives, and I never saw the news integrating those narratives into the coverage,” Saldaña said. The panel was closed by Sue Robinson, the Helen Franklin Firstbrook Professor of Journalism research chair in the University of Wisconsin-Madison’s School of Journalism & Mass Communication. 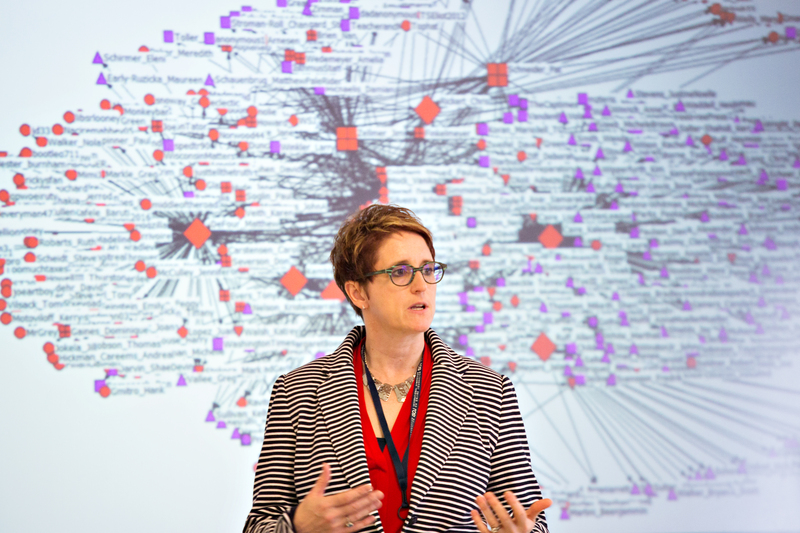 Her research led to a book involving an analysis of how social platforms are reconstituting mainstream social media flows through a digital lens. Through this lens, Robinson looked at how people were talking about race, particularly racial disparities in Kindergarten to Grade 12 classes in Madison, WI. Through this research, Robinson looked at people who would talk about the issue, those who wouldn’t and who could be trusted. “I scaled it to four other cities besides Madison but there is also Evanston, Ill., Chapel Hill, NC., Arbo, MI., Cambridge, MA. All of these were connected to large universities and had huge civil rights histories that played into this long-term enriched identity . . . perpetuating these large disparities between white kids and black and brown kids as well,” Robinson said.